The inaugural season of the Alliance of American Football, or AAF, kicked off last week with all four home teams coming through with victories. Now, each of those teams is favored to win the very first 2019 AAF championship according to the latest 2019 AAF odds. After dominant wins that highlighted the quality of their rosters, the Orlando Apollos and Arizona Hotshots are now 2-1 co-favorites to win the league in April. They're led by former college football head coaches Steve Spurrier and Rick Neuheisel, respectively. With so much uncertainty in a new league, before you lock in any 2019 AAF picks to win it all, be sure to see the 2019 AAF predictions from pro football expert Mike Tierney. A renowned sportswriter whose work appears in the New York Times and Los Angeles Times, Tierney has reported from seven Super Bowls. He's intimately familiar with all levels of pro football -- including the young, hungry players who populate the AAF -- and knows every coach's philosophy and approach to devising game plans. Tierney was all over the Patriots in the 2019 Super Bowl, enabling him to finish the season with a sparkling 63-46 record against the spread. Then, in Week 1 of the 2019 AAF schedule, he nailed both of his against the spread picks on Sunday, with the Birmingham Iron and Arizona Hotshots covering as home favorites. Anyone who has followed him is up big. 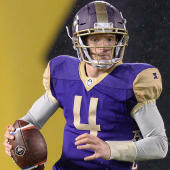 Now, with the AAF set to kick off its second weekend on Saturday, Tierney has evaluated all eight teams and released his pick to win the April 27 championship game in Las Vegas. One shocking team we can tell you that Tierney is fading: the Orlando Apollos, whom he says don't deserve their co-favorite status at 2-1. The Apollos may have cruised to a 40-6 victory over the Legends last Saturday, but Tierney questions whether legendary Florida and South Carolina head coach Steve Spurrier will stay engaged. They'll be tested by a stingy San Antonio defense Sunday on CBS Sports Network at 4 p.m. ET. Orlando could struggle to run the ball as authoritatively against better defensive fronts in the AAF. They racked up 135 yards rushing against the Legends, but the Commanders only allowed 99 yards on the ground against the San Diego Fleet and held their opponent to just 15 points in a low-scoring loss. Spurrier and the Apollos will have to prove their offensive success is sustainable to merit such short odds. We can also tell you that Tierney says the Salt Lake Stallions are overvalued at 8-1 to win it all. They played the Hotshots tight for a half in the opener, but turnovers were ultimately their undoing. And Tierney has serious concerns about what an injury to starting quarterback Josh Woodrum might mean for their season. Woodrum had to leave the game on Sunday and was unable to return. If that injury lingers and Matt Linehan has to start, the Stallions run the risk of a devastating 0-2 start in a 10-game season, which makes them a dangerous back to win the championship. Instead, Tierney is going big with a major underdog to win the inaugural AAF championship. He's basing his pick on a QB-RB combo that's perfectly suited to win this new league, given its wrinkles. You absolutely need to see who it is before locking in your AAF picks. Who wins the AAF championship? And which QB-RB combo is tailor-made for this new league? Visit SportsLine now to see which team you should jump on, all from the incomparable expert who just racked up another big cash in the Super Bowl.